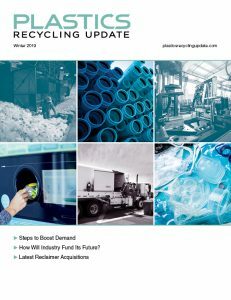 The national plastics recycling rate fell slightly from 2014 to 2015, as the country recycled less but generated more of the material, according to the U.S. EPA. The EPA’s Facts and Figures Report states the U.S. in 2015 recycled 9.1 percent of the plastic generated, down from 9.5 percent during the previous year. Not only did the percentage drop, but the actual weight recycled fell, as well. Americans recycled 3.14 million tons of plastics in 2015, down from 3.17 million in 2014. Results differed widely within specific product categories, however. For example, containers and packaging garnered a 14.6 percent recycling rate, whereas 6.6 percent of plastic durable goods and 2.2 percent of other non-durable goods were recycled. Within the container category, Americans recycled 30.3 percent of HDPE natural bottles and 29.9 percent of PET bottles and jars. The U.S. generated 34.5 million tons of plastic in 2015, of which nearly 5.4 million tons were burned for energy recovery and 26 million tons were landfilled. Combustion as a percentage of generation grew from 15.0 to 15.5 percent, although landfilling declined slightly from 75.5 percent to 75.4 percent. Across all materials, the country’s recycling and composting rate remains stuck at just over 34 percent, according to the report.